School hygiene, sanitation and water access have a significant impact on student’s success. In Ethiopia, 3 out of 4 girls won’t finish primary school. One of the biggest reasons is lack of clean water or a safe place to go to the bathroom. But where there’s safe water and school hygiene, there’s hope–no matter what your age. Balahne is a WASH Club member at Gafisse Primary School in Ethiopia. WASH (water access, sanitation and hygiene) clubs are student groups spearheaded by Lifewater staff–children learn the importance of washing hands, using safe water and keeping toilets and school grounds clean. Balahne is enrolled in the 8th grade, but he (quite literally) stands out in the crowd. The father of two young girls, Balahne is in his late 20’s and has returned to school inspired to learn. When he heard about the Lifewater-sponsored WASH program at Gafisse Primary plus the plans to build latrines and a safe water source, he decided to do something no one in his family had done before–finish middle school. Immediately upon enrolling in school, Balahne became an active member of the WASH club. The club shares school hygiene and health messages through songs, dramas, and poems. 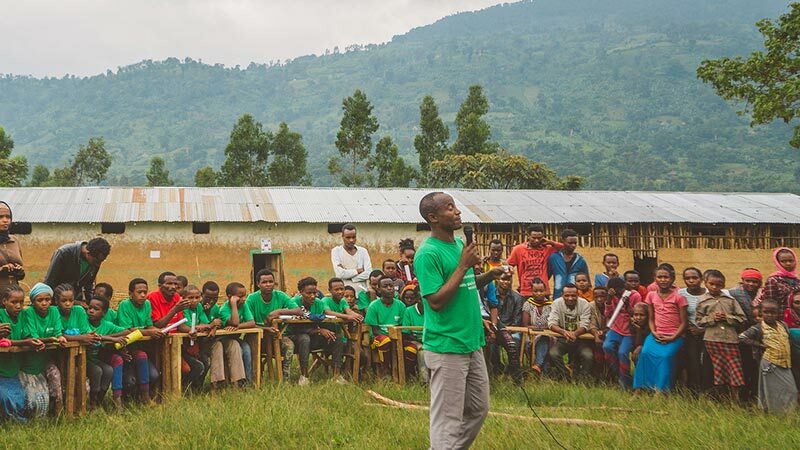 During Christine’s visit to Gafisee Primary, Balahne spoke to hundreds of students and parents gathered together, then began leading everyone in a song. Safe water, sanitation and school hygiene improve education, and education reduces poverty. As Balahne and his classmates make changes, they will impact their entire community, transforming life for generations to come.